I did not have a lot of time recently and I lost interest in the creatures games. That is essentially why there where no news or further development regarding AlbianWarp in the last few month... years. But the Project still sits there in the back of my head, and it annoys me that I don't have the time to bring it to an end, and to give to you, one of the most beautiful communities I know, what you are waiting for. What I plan to do is to provide a very basic client, server and basic tools that do nothing more then bridging CAOS and the network communication. aside from that I plan to write extensive documentation and a few basic example COAS scripts. Once the Client and Server are stable, and the API's are well documented, I will leave the rest up to you! You will not be entirely on you own though, no worries I will answer any questions as fully as I can I just cannot dedicate as much time in the CAOS Rewrite s I would like to, so you will have to take over here. Anyone with sufficient CAOS knowledge should be able to use the provided information to rewrite existing, non functioning, netbable NET: Caos code. or come up with own implementations that allow online communication of any kind. I plan to dedicate a few hours a week over the following months to achieve this state probably starting sometime this week. whenver I work on AW I will join the Discord(s) and IRC, so you can chat me up, if you want to. Great news! Nice to hear from you, ham5ter. Ham5ter, could you potentially make a Discord server dedicated to AlbianWarp? Discord servers are very easy to set up and we can always do with more of them. Thank you for paring down the project with the objective of getting a minimum viable API working, it must be painful to do but as far as a working warp goes anything is better than nothing at this point. I learned a few Things that will help me a lot with the further development. First of all, and probably the biggest change technical wise, I will write most of the Client in python3 as well, just like the Server. The second, really neat thing I learned just today, is the existence of the `NAMN` Caos instruction/command which in conjunction with a `LOOP`...`UNTL` can be used to enumerate and get all the named variable that are attached to an agent or creature. And the third reeaaly cool thing is, that you can attach Named variables to Creatures. Those attached variables stick with the creature even upon export, import and, that is the reeealy great thing, they even stick after clone import *wubwub!!!*. Name is lost? No Problem, restore it from the variable `aw_creature_name` *BOOM! * Name is not lost anymore! I am happy with these new developments and discoveries ! Very exciting! How could one get in on the alpha testing? Okay, Time went by to fast yesterday, had to go to bed before I was able to wrap things up in a nice update Post. Based on the discoveries made, in my last update post, i developed a System that allows general purpose "DirectMessageAgent"s to be sent directly between players. sets name "a_string "some message"
This Agent then can be used by an in game enumerator to do... basically whatever you want. The Named variable "aw_recipient" and the "family, genus, species 1, 1, 35753"
On the receiving end the "aw_recipient" variable will be replaced by the "aw_sender" variable and an additional variable "aw_date" which contains the time stamp of when the Agent was sent, is added, and the species is set to 35754. All custom variables are kept intact. I released a very early Alpha version code named "alpha alpaca" containing this functionality as well as authentication, registration and basic housekeeping functionality, to the people interested in the Caos Coding Cave discord. Mea and Aiko helped me test the Client, and Game modifications on another Windows 7 and a Windows 8 Box, but as this early version was limited to just sending Test Agents back and forth, the alpha alpaca release was rather boring at this point in time. Aiko then grabbed the alpha alpaca by its fluffy mane tamed it and teached it a cool new trick! 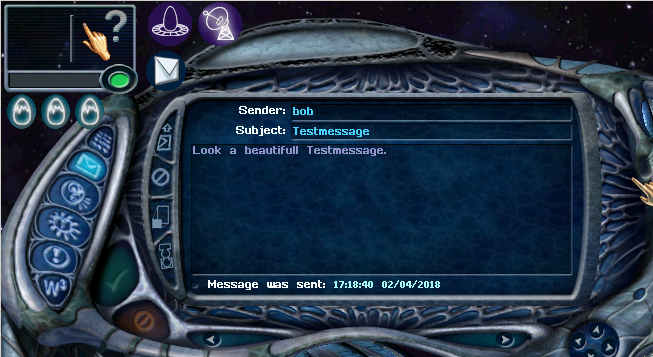 Based on the DirectMessageAgents, she implemented a working prototype of the ingame mail message system, this made things much more exciting as it shows that the DirectMessageAgents can easily be used for this and that keeping them as customizable as possible was a good design decision, as no Server side modifications where needed for implementing the mail System! Aiko and I re iterated over the modifications she made, sent messages back and forth, fixed a few bugs, and now I am confident to say that we got basic mail messages working, there are still untested scenarios, like sending gibberish, containing weird Symbols and stuff, but those would not crash the server, possibly the client though. The thing I am currently working on is to implement a similarly general purpose approach for sending and receiving creatures, based on PRAY files, exported, and re imported into the game on sending/receiving end. After sending creatures across the wire, there is just a few more thing to implement to make it for a early access beta/alpha whatever release. feel free to play around with it, If you find something weird, open up an issue, or talk to me directly via Discord, I am around on all the Creatures Discords known to me ^^. I will try to keep it up to date. Excited to see you all working on this again. Way above my head! A quick update, Albian Warp has come along really great! Aiko, wrote a really extensive, and great Blog post, describing the development and general journey of Albian Warp, separated into 7 parts, over on the Albian Warp Blog. If you want to know whats up, and how Albian Warp came together thus far, I highly recommend reading the series . Meanwhile the last stuff on the project board is finished, documentation is being written and a beta version is being worked on. Not by me, all praise go to Ham5ter and Amaikokonut! Oh no, nobody posted part 5! Oh, man, seeing that chat box brings back enough memories to make my eyes prickle. I miss warping random creatures with their gravity reversed so people'd call me up asking why their norn was on the ceiling. I miss making friends, I miss that guy who showed me the XD emote for the first time. If you bring back the warp I'm going to first full-on cry, second, well probably cry a bit more, and then worship you properly as gods should be. What is the actual state of the project ? I still need to download it and test it out. Heard some great things so far. I miss warping random creatures with their gravity reversed so people'd call me up asking why their norn was on the ceiling. Physics adapter from The High Tech Hand. Though it can be done from the chaos console. Yeah, I've never thought of using it on creatures, but I suppose that *would* do it.